When we create a Bean we are creating actual instances of the class defined by that bean definition. We can also control the scope of the objects created from a particular bean definition. Single bean definition to any number of object instances. Bean definition for each request. Only valid web-aware Spring ApplicationContext. Bean definition for a session. Only valid web-aware Spring ApplicationContext. Similar to session but the only makes sense in the context of portlet-based web applications. Only valid web-aware Spring ApplicationContext. Employee is Singleton and Student is Prototype. Now let us see how to get these scope of bean through Java code. scopeName and value are aliases, we cant mention both together. 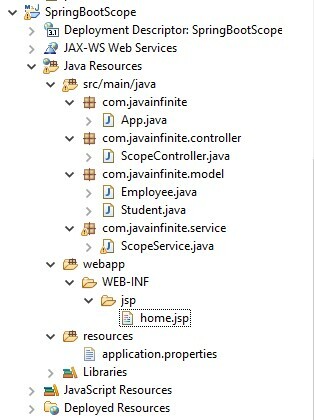 org.springframework.beans.factory.BeanDefinitionStoreException: Failed to parse configuration class [com.javainfinite.App]; nested exception is org.springframework.core.annotation.AnnotationConfigurationException: In AnnotationAttributes for annotation [org.springframework.context.annotation.Scope] declared on class ‘com.javainfinite.model.Employee’, attribute ‘value’ and its alias ‘scopeName’ are declared with values of [singleton] and [ScopeName], but only one is permitted.